Star Boy was a guest artiste on MTV Base where he spoke about Ms Kedike. “I’ve had a huge crush on Chidinma for a long time… she doesn’t know it but it’s true. ” Wizkid Revealed! Maybe, we should be expecting a collaboration track from them with Wizkid’ revelation of his love for her. 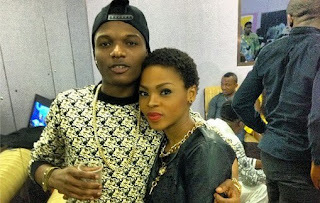 In 2015, Chidinma known as Miss Kedike admitted that she was finally in love. “Yes there is someone in my life,” she simply stated. She has also denied allegations that she was dating the Soundcity presenter, Adams Ibrahim. “The truth is, most people assume. The public has given me so many boyfriends, and funny enough, I haven’t met some or had a conversation with them. Talking about Adams, he is my friend, we have been friends for a long time and it is normal for people to attach something to it most especially if it’s a relationship with the opposite $ex. I have other friends too, like Dammy krane, Flavor himself, to mention but few. However, I have understood that things like this are part of the business and I just have to manage it.